While insurance has never been cheap in New Jersey, costs have been relatively stable for the last 15 years or so. That could change for the worse under legislation that is about to get a committee hearing in the Assembly. The “Bad Faith” bill under consideration in the legislature could raise auto insurance rates by 39 percent, as well as the costs for general liability and other insurances. That’s why NJBIA is asking its members to contact legislators and urge them to vote No on S-2144 and A-4293. “The message we are trying to send is, Don’t touch my insurance,” said NJBIA Chief Government Affairs Officer Chrissy Buteas. “This bill would open the flood gates for lawyers to sue for anything they deem ‘bad faith’ and put insurance companies and their policy holders over a barrel. “The resulting litigation costs would fuel a jump in insurance premiums that would make New Jersey even less affordable than it already is. We need to stop this bill,” she said. NJBIA is partnering with the Insurance Council of New Jersey to organize a grassroots campaign to stop the bill. Companies can contact their elected representative using the council’s Voter Voice system. Go here to call Assembly members, or go here to send them letters. S-2144/A-4293/3850 would rewrite the legal definitions of good faith and bad faith in a way that overzealous attorneys would be able to sue insurance companies for normal mistakes that occur in the ordinary course of business. The unfortunate reality for many companies, particularly good actors, is settling the case out of court often makes more financial sense — even if the defendant is convinced the case is winnable. Act now and make your voice heard. Please click here to call Assembly members, or go here to send them letters. For more information please visit the Don’t touch my insurance website. “Bad Faith” bill could be acceptable if it included a clause that makes both the complainant AND attorney proportionally liabile for defendants costs if they lose. Since many attorneys take cases on contingency, let them also enjoy the cost with same contingency. Steve – your positioning is shockingly inaccurate and misleading. How can you defend the smoke and mirrors that are so pervasive in the healthcare industry? ALL major health insurers providers hide behind the “experimental and investigational” excuse when they systematically reject ALL major claims in an effort to reduce their payouts and increase their profits. I have direct experience enlisting NJDOBI multiple times to force my NJ based insurance provider to pay for procedures which are clearly covered under my policy. It is about time insurers are held accountable for their intentional, systematical and malicious ‘bad faith’ denials. Stop making them out to be the victim. 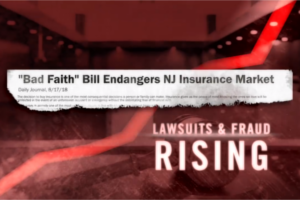 NJBIA is clearly biased as they are trying to protect their own interests and the interests of the big insurance companies headquartered in NJ. Fear marketing is ineffective as any educated person can easily see the reality of the situation. Bad Fait works in other states so why not NJ? I’m voting YES ! !